LOCATION: Wetlands are areas where standing water covers the soil or an area where the ground is very wet. Unlike estuaries, freshwater wetlands are not connected to the ocean. They can be found along the boundaries of streams, lakes, ponds or even in large shallow holes that fill up with rainwater. Freshwater wetlands may stay wet all year long, or the water may evaporate during the dry season. There are many different types of freshwater wetlands, all of which have different names. This can sometimes lead to confusion. These are all names of different types of wetlands: marsh, bog, fen, swamp, mire, slough, and prairie pothole. These places can look very different, but because they are all areas with wet soil, or where water covers the soil, they are considered wetlands. PLANTS: Freshwater wetlands have a variety of plant types, and each different type of wetland may have different kinds of plants. The plants discussed here are fairly common. There are floating plants, such as duckweed, that extends its roots down into the water to absorb nutrients. The duckweed floats freely and is not attached to the bottom. 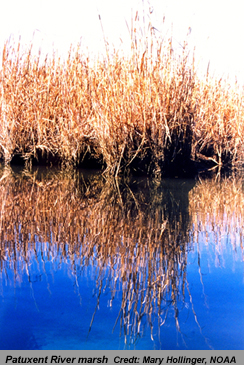 Cattails and sedges are common plants that grow up from the soil, through the water. ANIMALS: As with plants, the types of animals found in wetlands depend upon the type of wetland. There are, however, some general types of animals that will be found in most wetlands. All kinds of amphibians (frogs, toads and salamanders) can be found. Amphibians require water in which to lay their eggs and for the tadpoles to grow to adulthood. Wetlands are a perfect environment for this. In fact, when visiting wetlands, one of the first things you a may hear are the calls of frogs. Sometimes, especially during the mating season, they can be so loud it’s hard to hear anything else. Insects are an important part of the plant and animal life in wetlands. They help to pollinate plants and provide food for birds and amphibians. Watch out for the mosquitoes! You may want to bring your insect repellent when visiting a wetland because mosquitoes thrive in areas of standing water. Feel like taking a swim in a wetland? Before you jump in or even wade through the water, you may want to consider another wetland animal with a bad reputation: leeches. Most leeches prefer environments with standing water, making freshwater wetlands a perfect home. They feed by latching onto another animal or a human and sucking their blood. You often can’t feel them when they latch on and so may be surprised to look down and find yourself being eaten for lunch. Leeches aren’t all bad. Doctors use them to help with blood clots and to improve circulation to areas of the body after surgery. Wetlands are also home to an amazing number of birds. Many birds would go extinct without wetland habitat in which to breed, build nests, raise young, feed and rest along migratory routes. 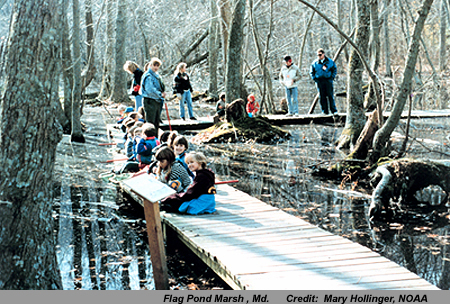 PEOPLE AND FRESHWATER WETLANDS: Freshwater wetlands, like estuaries, provide very valuable services to people. They provide fish to eat and flood protection during storms. They also filter our water, giving us clean water to drink. Because of these valuable services, it is important that we work to conserve our wetlands.